Transportation Minister hopes the investigations against Netanyahu conclude quickly so that he can continue to fulfill his role. 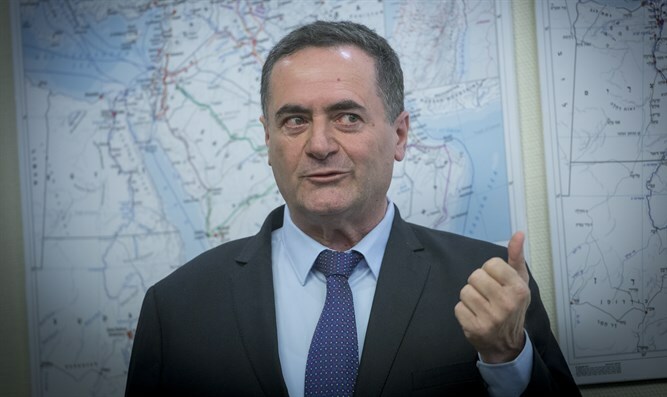 Transportation Minister Yisrael Katz (Likud) on Sunday held a conference at his home in Moshav Kfar Ahim, in south-central Israel, attended by hundreds of supporters and Likud activists. "I intend to run for the leadership of the Likud and for prime minister as soon as Binyamin Netanyahu resigns," Minister Katz announced. At the same time, he wished Prime Minister Netanyahu that "the darkness of the clouds over his head will soon pass and that he can continue to faithfully fulfill his role as he was elected to do." Minister Katz praised the prime minister, saying, "There are and always will be various arguments and positions - as is customary in political life - but the friendship, the shared vision and seeking the good of the state will always stand above everything." On the subject of the nuclear agreement with Iran, Minister Katz said that "the agreement in its present form will allow Iran in a few years to hold nuclear capability and turn the Middle East into the most dangerous place in the world." Katz made a similar statement in February, saying in a radio interview that he would contend for the Likud party leadership but would only do so after Prime Minister Netanyahu decided to resign from politics. "I said that I would contend after the Netanyahu era, I did not mean during the period when Netanyahu was being interrogated and I will not run against him," he said at the time. "When this happens I hope to win in person and not in the polls. The polls have no significance at present since 'the king is still on his throne.'" There have been speculations that Netanyahu may be forced to step down due to him being under investigation in Case 1000 and Case 2000. In Case 1000, Netanyahu is suspected of receiving gifts from billionaire benefactors, including from Israeli-born Hollywood producer Arnon Milchan, who last week was questioned in London in connection with the case. In Case 2000, Netanyahu is suspected to have formed a deal with Yediot Aharonot publisher Arnon “Noni” Mozes that would have seen Netanyahu advance legislation to close down the Sheldon Adelson-owned Israel Hayom, in return for more favorable coverage from Yediot Aharonot. Netanyahu has rejected reports that he intends to dissolve the Knesset and hold elections in the wake of the police investigations against him. “I'm not going to go to elections. I intend to complete this term and lead the Likud to a big victory in the 2019 elections," he said last month, stressing that support for the Likud remains strong. "You have to come and see. Not just at conferences, walk with me in the street and you’ll see it. I do not remember such support since 1996. I see tremendous strength, there is no other word to describe it,” the prime minister said.